How do you measure marketing? It’s the age-old question that has stumped many a marketer. In fact, if you ask 10 different people what marketing metrics you should be tracking, you’ll likely get 10 different answers. In general, though, most marketers agree that things like revenue and ROI are the holy grail of metrics. The trouble is, it’s hard for most businesses to reach this pinnacle of marketing measurement. Between long sales cycles, multiple touch-points, and complicated attribution, equating marketing efforts directly with revenue can seem out of reach for many businesses. Rather than just giving you a list of metrics that you don’t know how to track, we’ve assembled this brief video and a more in-depth guide below on how you can think differently about your metrics and build a system for measuring your digital marketing from the ground up. Let’s get started! Start with Goals. Then Align Metrics. The first step to measuring your marketing successfully is knowing your goals. Goals give you a target to aim for and help you focus on what you should measure. Without a goal, marketers can fall into the trap of trying to measure everything. But with a specific goal, knowing what to measure becomes much easier. If your goal is to get 20 qualified leads per month, you know you need to track number of leads and lead quality. In that case, metrics like conversions, conversion rate, and lead to sale ratio are key. Whatever metrics you choose, make sure they provide actionable insights that help you reach your goals. For example, take our goal of 20 qualified leads per month. Let’s say that a large percentage of your leads come through your website. You may be tempted to look at metrics like website traffic. But if you increase your website traffic, does that necessarily mean you’ll get more leads? Metrics like click-through rates on offers or conversion rates on landing pages will probably give you more actionable information. If you want to measure your marketing, you have to do things that are trackable. This may sound obvious, but too many businesses struggle to see the value of their marketing because they don’t have any methods in place to track their results. Especially if you have a long sales cycle, you need ways to keep track of your prospects along the way, since it may take months and multiple touch-points to convert them into customers. For example, let’s say you’re running a 10% off special, and you want to know which of your marketing efforts is helping to generate more sales. You send out a tracked URL in your email newsletter and a different one on your Facebook page. Both go to a landing page on your website where customers can download the coupons in exchange for their email address. Using a free tool like Google Analytics, you can tell how many visitors are coming from each channel, and what percentage of them are downloading the coupons. From there, you can keep track of sales using the 10% off coupons to know how much revenue your marketing efforts are generating. While it’s typically easier to track digital marketing, even traditional channels like print or radio can be at least partially measured with unique Calls to Action. For example, if you include a unique tracked phone in a radio ad, you’ll be able to tell how many people respond to it, even if you can’t tell how many people heard the ad overall. Technology also helps make tracking much easier. Google Analytics or some type of web analytics software is a no-brainer for any marketer today. 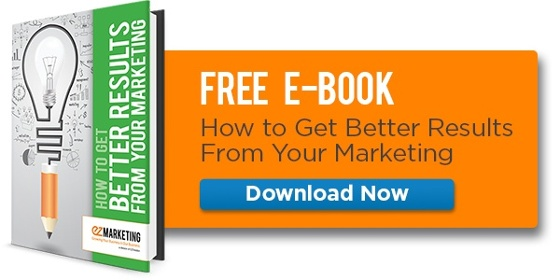 Beyond that, there are countless software programs that can help you track your marketing. We typically recommend form/call tracking to help you measure your inbound leads. For more advanced marketers a full CRM/marketing platform like HubSpot or Salesforce can also be invaluable. Now that you have clear goals and trackable steps in place, you can start building your metrics and KPIs. Here’s where most owners and executives want to jump straight to measuring revenue and sales. The trouble is: if you skip straight to the bottom line, you might miss tracking key metrics that tell you if you’re implementing your marketing correctly in the first place. Too often, business owners simply conclude that certain marketing efforts “don’t work” when they don’t see the sales impact, without knowing whether the campaign was well-executed or not. It’s like trying to lose weight, and concluding that your diet isn’t working, without realizing that your scale was broken the whole time. Instead, try building metrics from the bottom up. 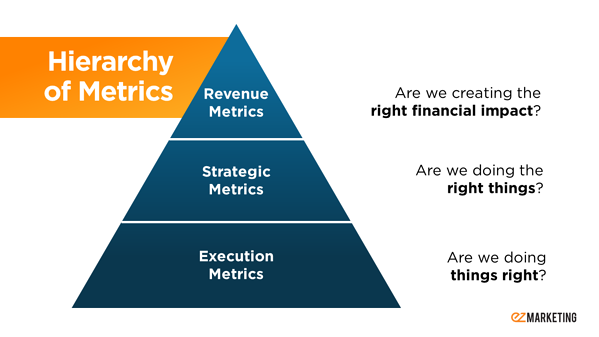 Look at Execution metrics first to make sure that you’re doing things right. Using the dieting analogy, this is making sure that your scale is reading correctly, and that you’re tracking your calories and exercise accurately. Next, look at the bigger Strategic picture to ensure you’re doing the right things. Should you be cutting out more carbs in your diet, or is getting more exercise the bigger priority? Finally, look at your Revenue metrics to ensure your efforts are creating the right impact. Are you achieving your desired goals and results? Let’s take a deeper look at this hierarchy and how to build your marketing metrics from the bottom up. Measuring the effectiveness of your marketing starts with managing individual marketing activities – things like email blasts, social posts, print ads, content offers, etc. Focus on consumption, sharing, and engagement metrics. These include traffic, views, clicks, likes, shares, comments, and downloads. For example, to know if you’re doing things right for an email campaign, you might look at open rate, click rate, and unsubscribe rate. If you’re announcing a special and only 8% of recipients are opening your email, you’re unlikely to get a ton of sales from that email. 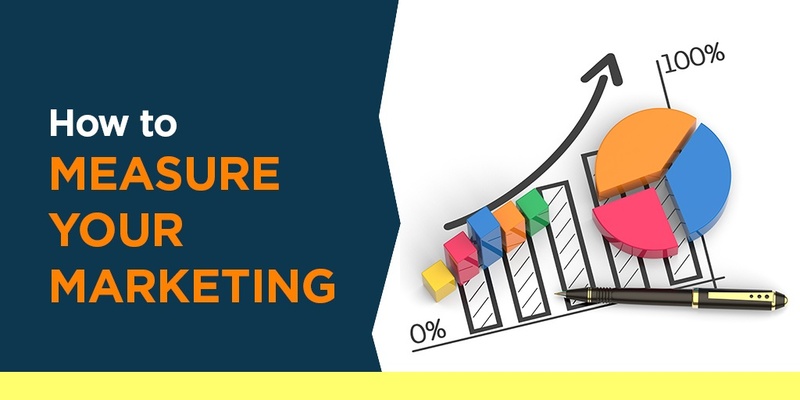 Strategic metrics focus on managing the overall marketing function. Even if you’re executing individual marketing activities well, you need to make sure those efforts support the bigger picture. Focus on things like lead generation, customer satisfaction, or which marketing channels are most effective. Specific metrics you might track include conversion rates, cost per lead, marketing-sourced opportunities, customer retention rate. For example, if you’re trying to decide whether to invest in more SEO services, you might look at what percentage of your organic web traffic converts to a lead, and what the cost per lead is compared to your other marketing efforts. Note too that this part of the hierarchy includes less precise measurements like brand awareness and thought leadership. Try to make these concepts more concrete by tying them to specific outcomes. For example, you might look at content asset downloads, or share-of-voice on a topic compared to competitors. Finally, we've reached the pinnacle: revenue metrics. These are the metrics that matter to the business as a whole, and they’re the only ones that top-level executives truly care about. Metrics here include revenue generated or influenced by marketing campaigns, ROI, profit, and customer lifetime value. To report on revenue metrics, you need to have solid tracking in place for all of your sales and where they are coming from. You also need to know the costs for all of your marketing efforts. After all, you can’t calculate ROI if you don’t know how much you’ve invested in your marketing. Nearly every business wants more leads and customers, but knowing where they’re coming from helps you determine which channels are performing best, and where to focus your marketing budget. How many of your prospects become leads? How many of those leads do you close as customers? Knowing how prospects move through your pipeline is important for many reasons, but especially because it gives you an idea of how much marketing you need to hit your goals. So you need 500 new prospects. You decide to do PPC advertising, and your average cost per click is $3. By understanding your pipeline, you know you need to spend around $1,500 to get the 500 click-throughs (prospects) who will eventually convert into 10 customers. 3. What a customer is worth to you? Understanding your pipeline lets you know much you need to invest to get more customers. Knowing what a customer is worth lets helps you decide what you should invest. Looking at the example above, you know you need $1,500 in ad spend to gain 10 new customers. That’s $150 per customer. If your business sells $10 t-shirts, and the average buyer only spends about $50, this is a bad investment. On the other hand, if you’re selling $5,000 sheds, this is a fantastic investment, and you should probably increase your ad spend. Ideally, you should know the lifetime value of your customer to get a full picture of what each new sale is worth. At the very least, track the average value of a sale. Lastly, to understand the ROI of your marketing efforts, you want to track the revenue you generate from marketing sources. Depending on your business and the complexity of your buying cycle, this can be one of the most difficult metrics to measure. Here’s where attribution comes in. Attribution deserves a whole blog post itself, which we don’t have time for here (but Marketo has an excellent one explaining the different attribution models). Most businesses use single source attribution, which gives credit to either first touch that generated the lead, or the last touch that generated the conversion. While these simple attribution methods don’t account for all the touches that happen in a longer sales cycle, they do allow you to show how your key marketing efforts influence revenue. Recap: So How Do You Measure Marketing?